21 is an important age for people in the United States. Your 21st birthday marks the day you can legally begin drinking alcohol, and it is often celebrated extravagantly. Over time, being of legal age becomes less about drinking to drink and more about enjoying a delicious beverage with a good meal. Of course, no alcohol goes better with dinner than wine. Most people have their wine preferences, however, there is an art to pairing wine with your meal. If you are inexperienced with wine pairings, here is a guide to the essential basics of choosing the correct wine. If you are eating a fish dish in a fine-dining restaurant, you should go for either a light dry white or a sparkling wine. These include Pinot Grigio, Sauvignon Blanc, Champagne, or Prosecco. The reasoning behind this is that fish’s lighter flavor profile pairs well with an equally light wine, so as not to overpower the dish. Also, dry wine is chosen rather than sweet, as sweetness may clash with the savory notes of the meal. That being said, there are red wines and rosé that can work with fish, but you would be safe in most cases by sticking to a dry white or sparkling. When we think of red meat pairings, deep red wines come to mind. It is rare that you will pair a steak dinner with something other than a medium or big red. Some popular varieties are Cabernet Sauvignon, Zinfandel, or Merlot. You may have a odd occasion where a hearty red-meat meal will pair with a non-red, but again, it is rare and likely to clash. Chicken and poultry can be versatile proteins, which opens their pairings up much more than a fish or red meat dish. For example, a chicken parmigiana would pair better with a red wine, while a roasted cornish game hen may pair with a rich white wine, such as a Chardonnay. The two components that make a difference are the color of the meat (light = white, dark = red) and the preparation, which can include a sauce. Red-sauce pasta can be paired with tart, medium-body red wines, which add acidity. Cheese-based pasta can be paired with many varieties, but white wines are typical. Seafood pasta should be paired with white, or rosé if there is a tomato sauce. 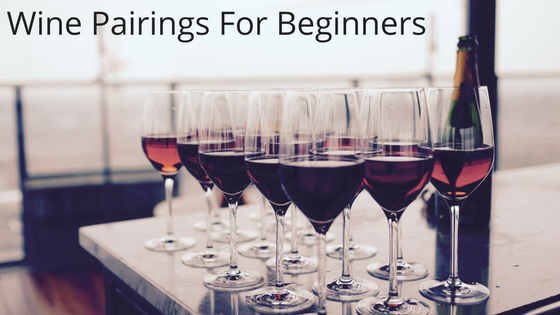 Although this is not an exhaustive list of how to pair wine, these tips should help you the next time you look to host a fancy dinner party or go out to a nice restaurant. Keep in mind that there are exceptions to each rule and, when in doubt, search online for pairings that go with your specific dish. You should easily find a few great options, and most of the time they will fit into these rules.